It's June 15th and summer is just around the corner! The kids are done with the school year and the slower summer pace is at our doorstep. It is welcome. 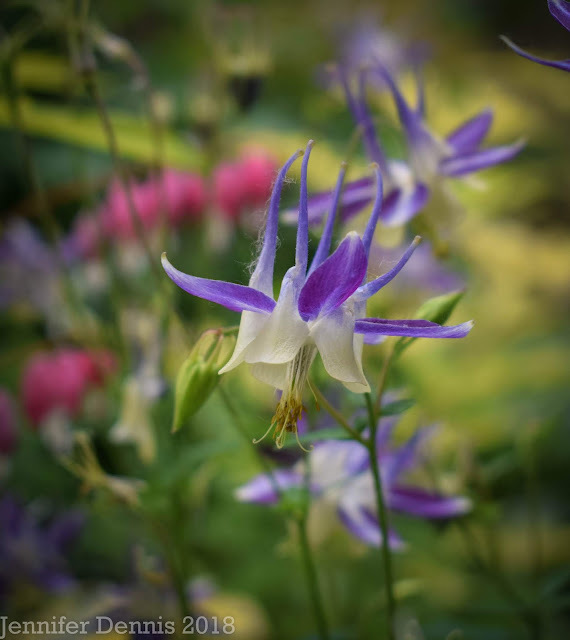 The aquilegia really take center stage from mid-May to early June. 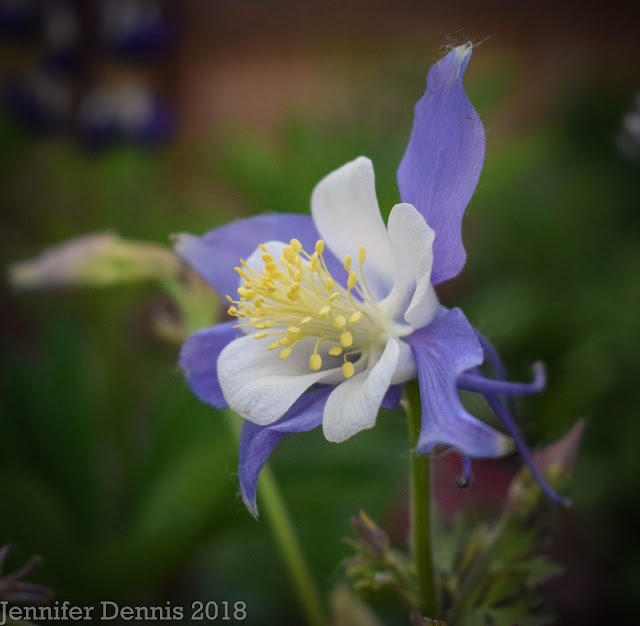 Most of my plants have been gifted to me, so I am always reminded of some of my favorite blogging friends when these plants bloom. 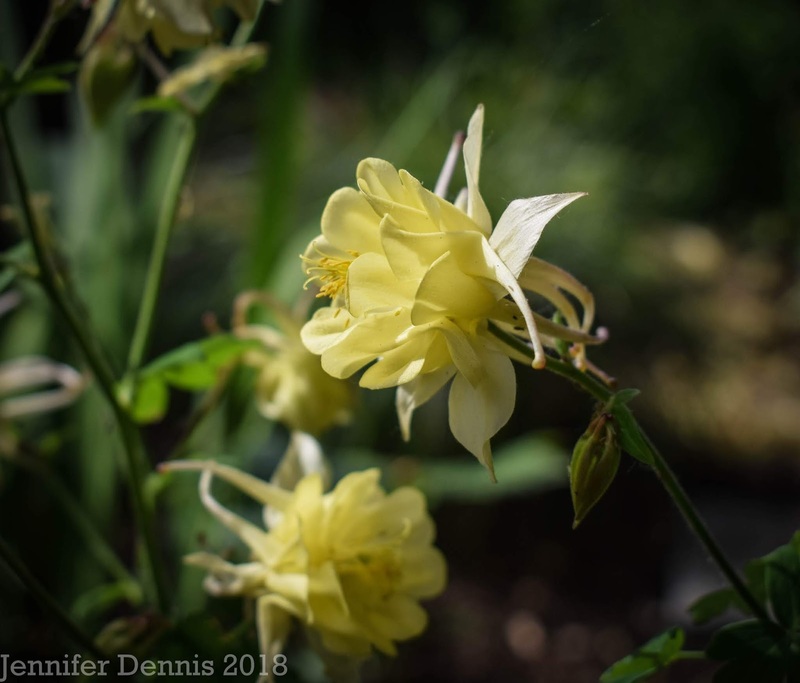 Here is another yellow aquilegia. Hmm, I like yellow? I need more colors! And the aphids this year. Good grief..it has been a year of aphids. Nasty things. Where are the lady bugs this year?? I don't seem to have enough around to eat up those little pests. I don't use pesticides, so it's the good and the bad. This is the first year of the past six where aphids have been problematic, hence, the bad. I might need to buy a box of lady bugs. The good part of not using pesticides is having bees, butterflies and dragonflies in the garden because there is nothing chemical to harm them. Here is a shot of a flying friend headed to my hedge of ceanothus 'Victoria'. 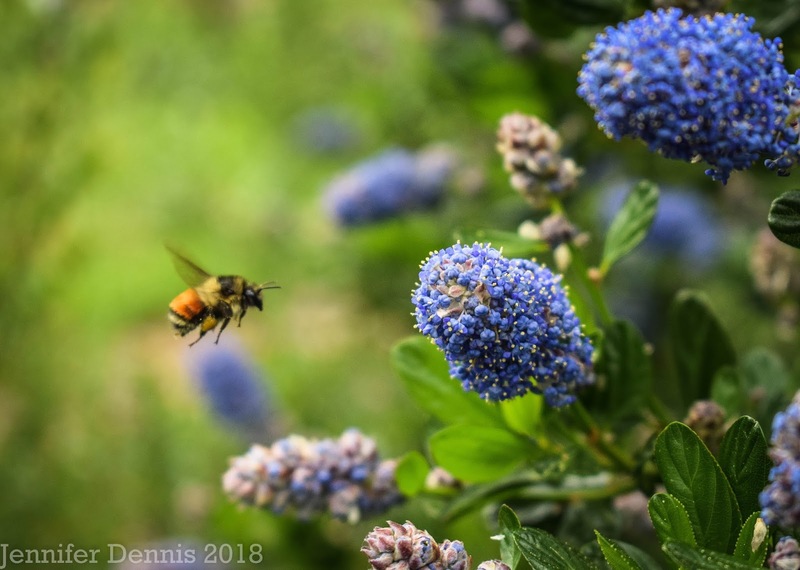 I had hundreds of bumble bees visiting my ceantothus this spring. 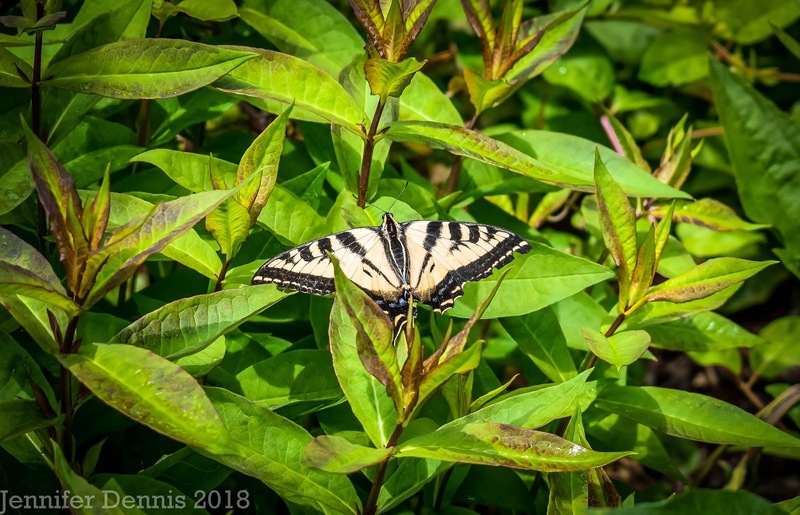 And the swallowtail butterflies are out and about. Here is one that came to visit my phlox. 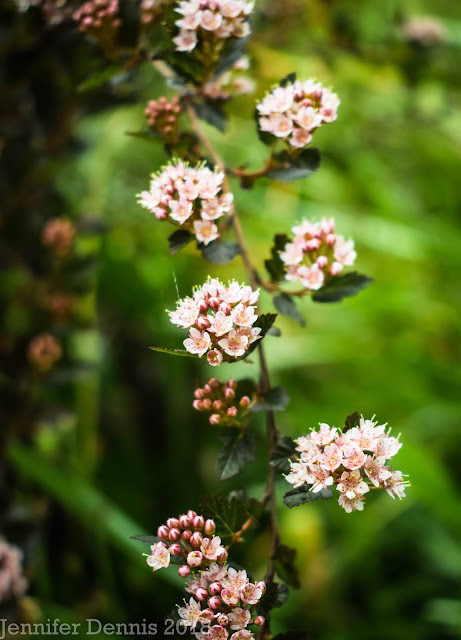 Sometimes the blooms of hedges steal the show momentarily. 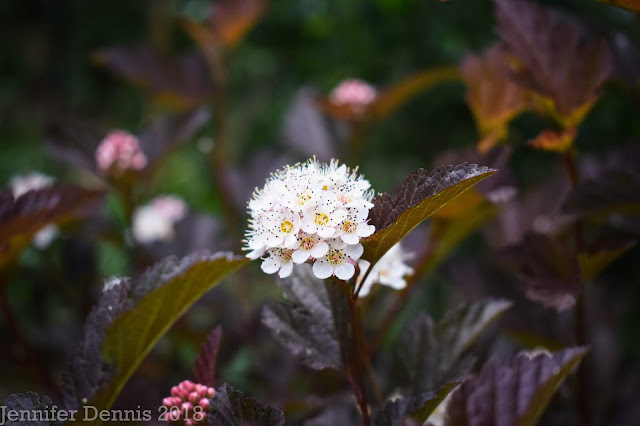 I use physocarpus in my gardens for a pop of burgundy/bronze foliage color, but their blooms are pretty nice too! 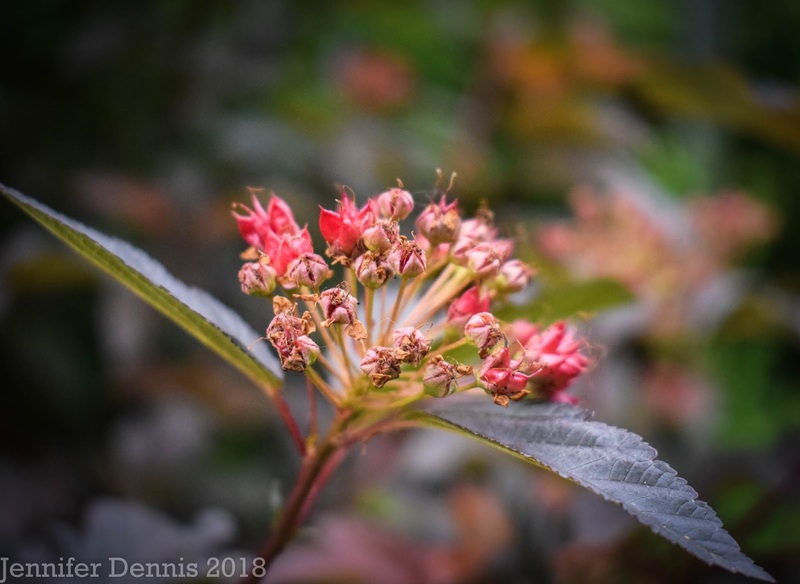 I'm not sure which ninebark I like best? 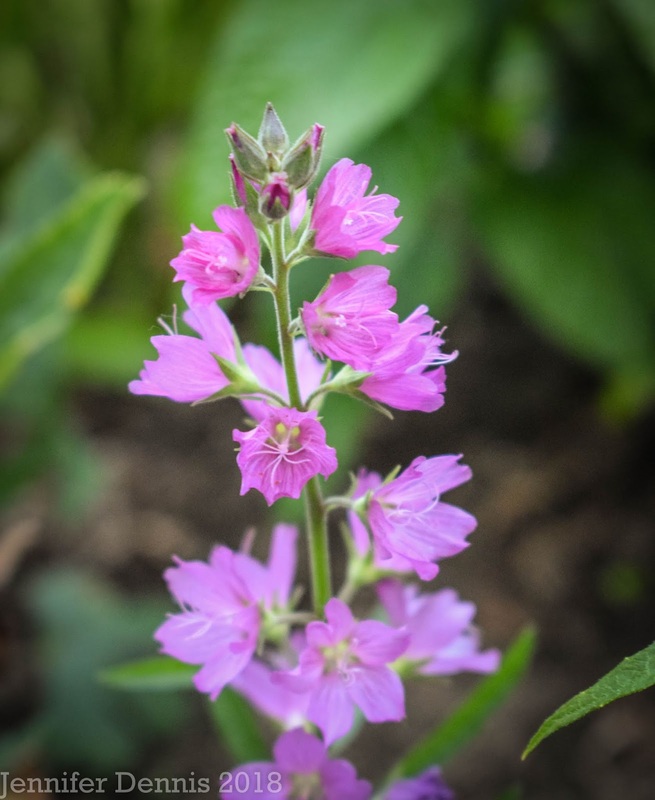 In the front of the house, the full sun flower bed has been blooming with iris, lupines and centranthus. This spring I added poppies, so that will be another bloom to enjoy next year. 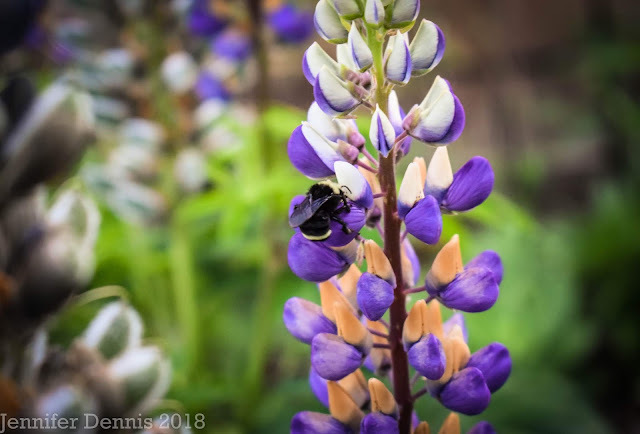 Here is 'Blue Shades' lupine. The bee's were busy for weeks at this plant. I've also added native checkermallow in a few spots. Other natives in the bed include camas, sedum and yarrow. The summer blooms are forming and I can't wait to see how they look. This is the first season of spring blooms for this garden bed. It will take a few more for the plants to mature and fill in the spaces. 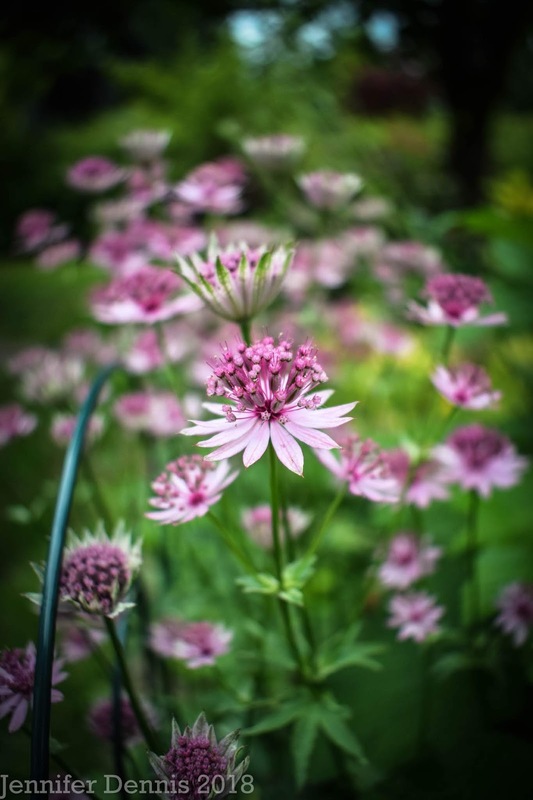 Newly purchased this spring is astrantia 'Star of Fire'. If I can get it to clump the way 'Roma' has...I'll be in heaven. 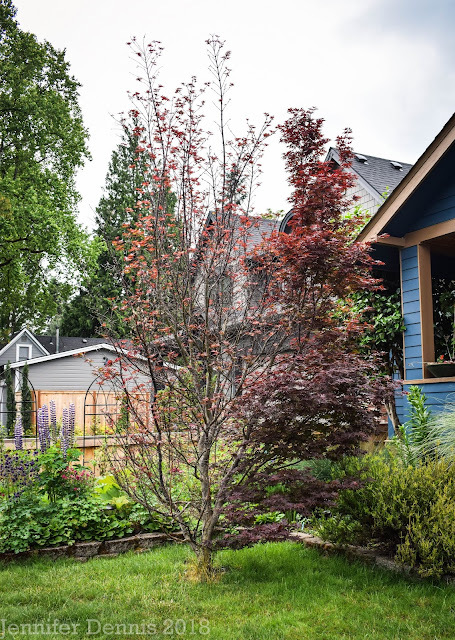 I moved many plants this spring to deal with the changes in sunlight around my yard due to the big new homes built next door and the large privet hedge that was pulled out of the front gardens. I'm feeling unsettled as many favorite plants did not perform as well as in years past due to the movement. Also, establishing a brand new flower bed is fun to plan, but I can't wait for when those plants to bulk up. I prefer the look of a mature garden. Thanks to Carol for hosting this monthly meme. Visit her blog May Dreams Garden to see what is blooming around the world in the middle of June. 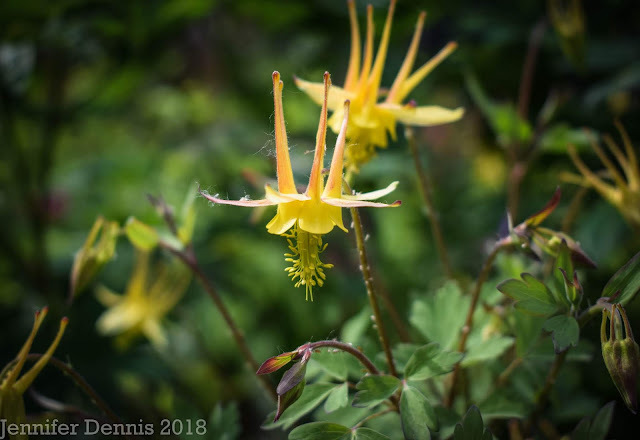 The aphids on my Columbines were horrid this year too. You have lots of pretty flowers. 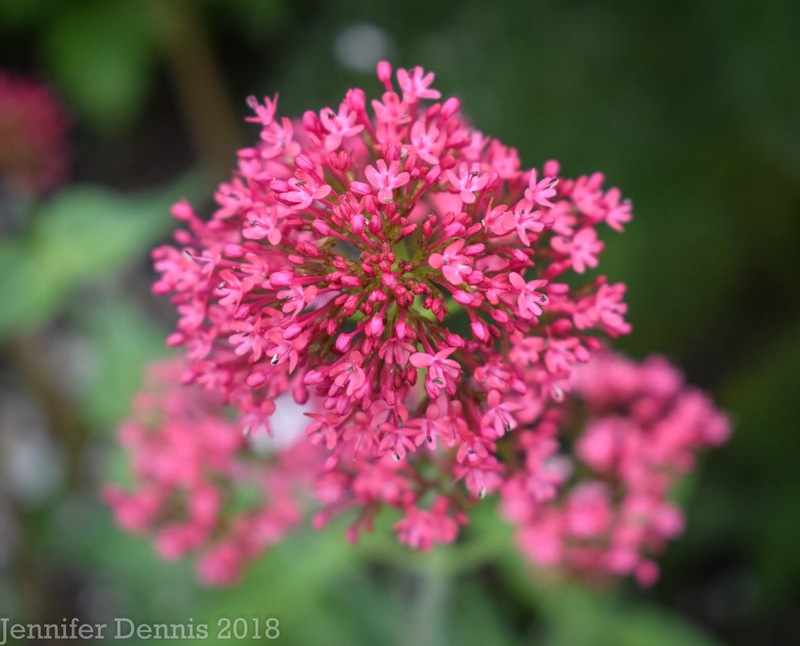 I sowed Centranthus seeds this winter and now I have seedlings, still waiting for a home in their little pots. Great shots of the bee and the butterfly! I love your Columbines, such beautiful shapes and colour combinations. 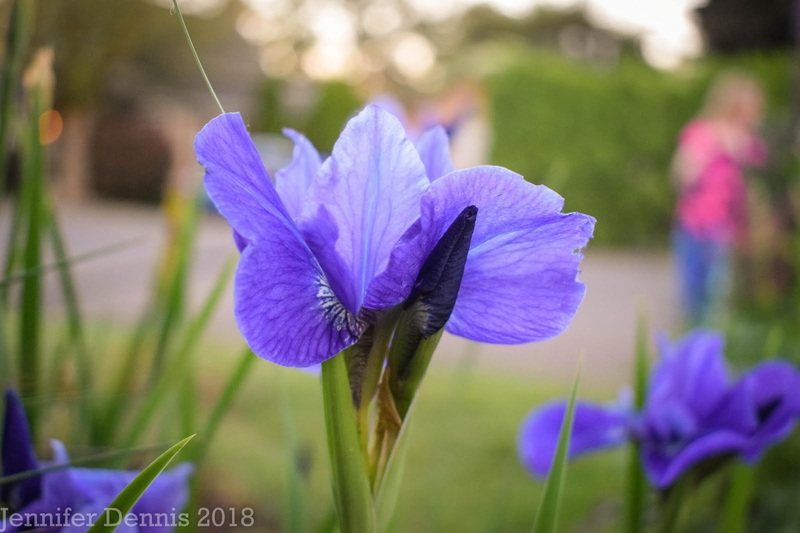 Having seen your post I might try iris in my front garden. Another plant to ad to the I want list. Those nine barks are stunning. I am growing a white Astrantia and have been thinking I should add Roma. What a beauty. Summer!!! 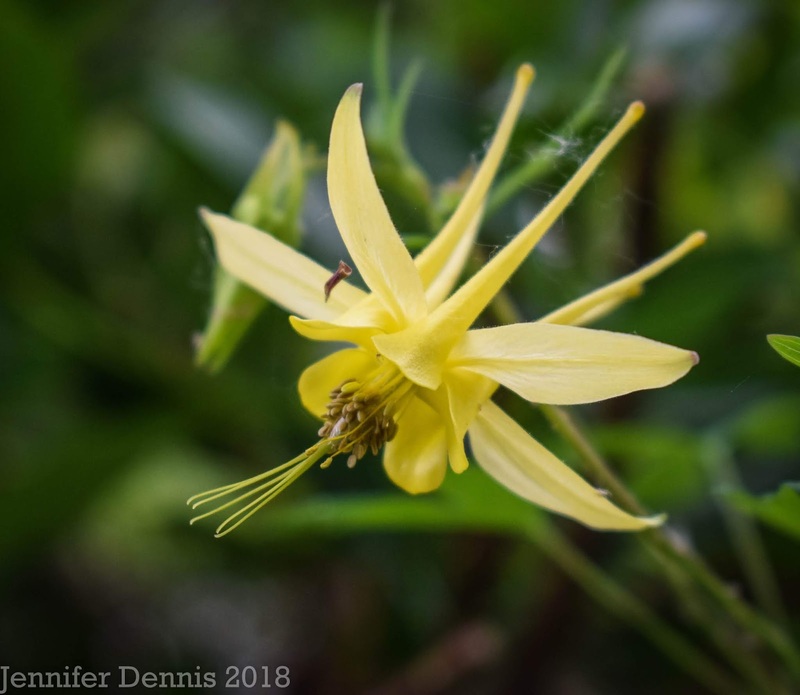 The season is off to a lovely start in your garden Jenni. I had hard luck in growing Aquilgea ,since seeds bought never germinated and seedlings were never available here. Funny, I've been plagued with aphids this year too. 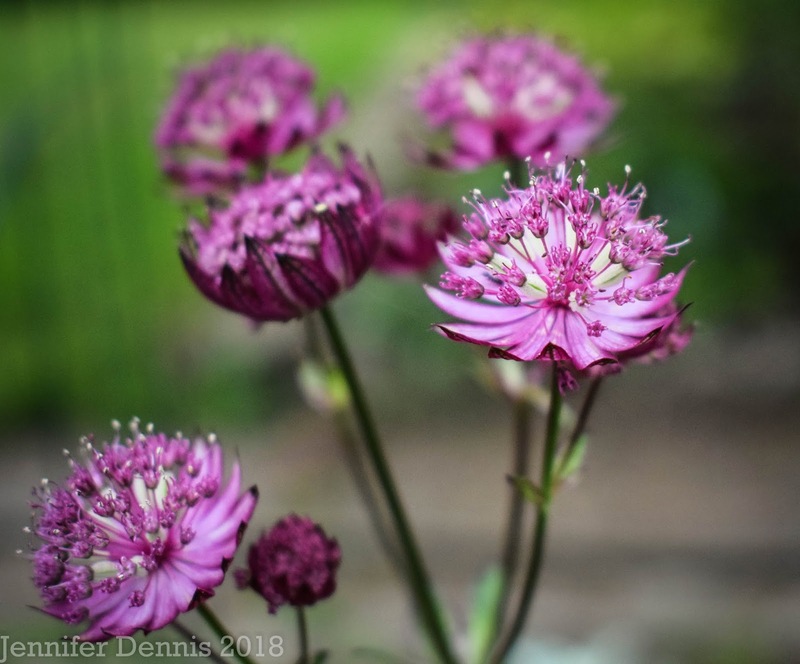 Roma is such a good astrantia. I split mine into four this year so it is taking things easy but I have a few blooms. I know what you mean about longing for maturity. I sometimes think I move things around too much!